I live next to the river and walk along it often enough that I have never taken a trip in the many tourist boats that ply the Thames, and frankly, thought I never would. Until I was offered a trip to watch the Jubilee Pageant. 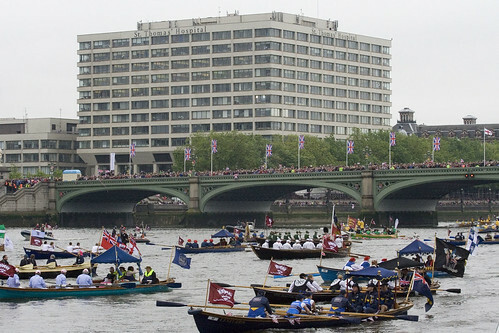 Although the flotilla was largely made up of historic and special boats, it was followed up by an armada of private leisure boats, and the tourist boats that had leapt at the chance to offer Jubilee Specials for those who wanted to buy their way into the pageant. An offer to be one of said persons as a guest of City Cruises was enough of an inducement, and having watched rather a lot of the participants arrive over the past few days, I was quite looking forward to it. Of course the weather turned into a typical Bank Holiday and the warning from our hosts about a 90 minute wait to clear security was looking very accurate after the queue at Tower Hill had moved maybe 10 feet in 20 minutes. We (a small group of London bloggers) were then taken out of the queue, leaving the people behind to ask if we were leaving and probably thinking we were mad. Actually, we queue jumped and got on board within a few minutes to then head towards Westminster where we would then watch the flotilla and then join on at the end to head back to Tower Hill. Passing along the Thames, the embankments on both sides were packed with people. The field next to City Hall had a huge TV screen hung from a crane, which later turned out to be quite a common sight along the river – and quite a clever idea frankly considering how long people would have been waiting to see any action. Despite the packed public areas, some evidently private seating areas were being left empty until the last moment – maybe they were all inside sipping champagne and munching on canapés? Under the bridges, almost everyone seeming to wave to anything on the river. Either getting in practice or maybe insurance just in case we turned out to be important and they can claim credit for waving at us. One sight that had me do a double take was what I later learned was a rehearsal for when the Queen passed by – on top of the National Theatre was the War Horse prancing a bit with a camera crew. 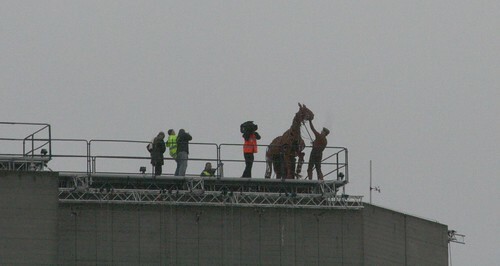 Not knowing what it was for a while leads to stunned shock that there was “a horse” on the roof of the Theatre. Under Hungerford Bridge – totally devoid of onlookers other than some hi-vis jacketed sorts and on the other side, lots of TV camera crews getting good vantage points. 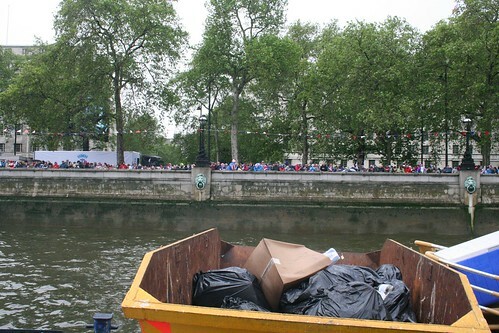 Then to moor up right opposite the London Eye, although also next to a barge containing old chairs and some skips as we waited for the pageant to begin, and eventually pass by. A long wait, but at least we were in the warm and dry unlike the spectators who you had to have some mute sympathy for. Finally, after a couple of hours of hanging around, the pageant started to arrive. The boat had a sliding glass roof/walls and these duly slid back and fortunately, the rain had stopped, even if the cold had not. 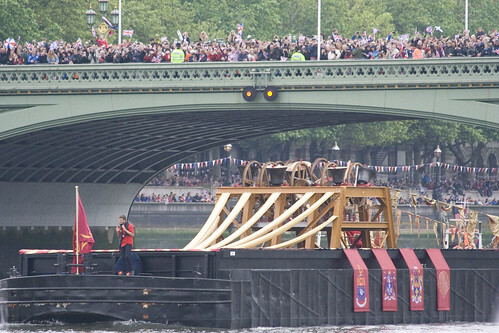 First was the barge with the bells on board, which I had read had been slightly ridiculed by some commentators, I quite liked them – a nice audible herald of the arrival of the floatilla. And I quite like church bells anyway. Along come the small boats, all powered by human endurance. 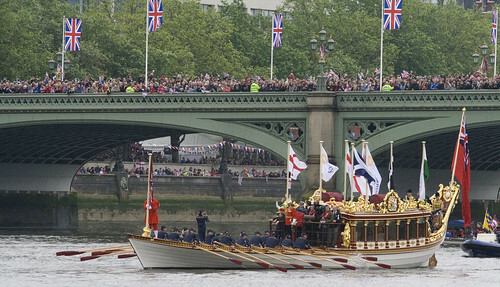 The new Royal Barge rowed past and lead to cries of “oh, was that it” until it was pointed out that the Royal Head was not on the Royal Barge, and would pass by later. 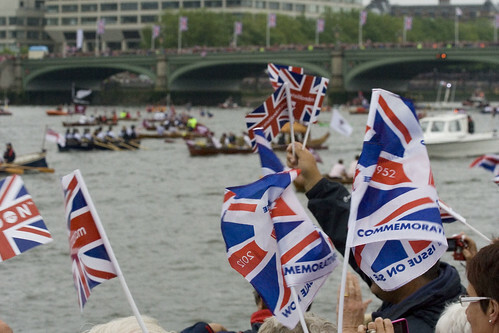 The Sea Cadets in little rowing boats and big flags – one for each of the Commonwealth. Some boats had earnest oarsmen, and others were rather sedate. So sedate that the passenger in one seemed to be reading a magazine while waving her hat. Finally along came the Spirit of Chartwell, which had been donated by the owner for the procession, and decorated in suitably regal fashion – and will doubtless earn her owner a fortune being hired out in future as the boat that carried the Queen. I have to admit that the Queen looked rather ghost like in a white shawl and hat. I also noticed that the south bank got rather more Royal waves than the north side of the river, which made getting photos of royal waving while facing us somewhat problematic. As everyone wanted to catch a glimpse of the royals and crowded on the riverside of the boat, it tipped quite noticeably towards the laden side, as did most of the other passenger boats that were lining the Thames in that area. At least we were close to the action though – in fact so very close that many of the smaller boats passed within inches of us. Once the Queen passed, I put the camera away and just watched and enjoyed the procession. It was just a parade of boats, but many of them were quite pretty to look at, and the steam boats tooted their horns most agreeably. Eventually though, up came most of the River Taxi fleet and then eventually, at last, we got to join in the flotilla. We may have been just a commercial boat, but the crowds still waved, even if the crowds were by now rather diminished on the earlier throngs as people drifted off once the Queen had waved at them. 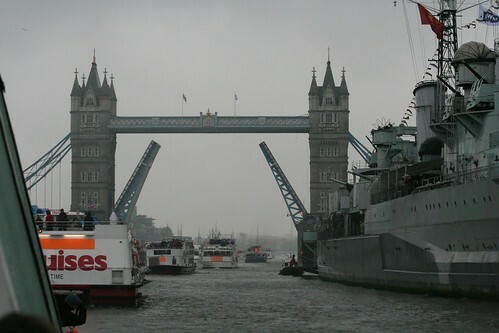 I suspected – and could see from the embankment TV screens that Tower Bridge would open for Her Maj, but I didn’t realise that it would stay open for the entire flotilla of boats. Including us. That was a first for me, and despite having seen it open absolutely loads of times, it was a bit of a thrill to be on a boat this time. Even if it was by now raining so hard that the windows had been closed and sheets of water were cascading down – making it impossible to photograph anything through the glass and causing precarious leaning over the side at the back to get photographs. Another wave from Her Maj and then further on to a turn around point so we could come back, by which time the bridge was closed and the Queen had left. It was starting to look like the aftermath of a party, and when we eventually docked and got back onto dry land, Tower Hill looked like the sky had rained plastic bottles and discarded sandwich packs. A long and curiously tiring day, considering we didn’t really do anything, but quite a rare one and worth accepting an offer from City Cruises for the trip. This looks very nice and sounds like you had a wonderful time. Most Americans are very interested in the events marking Her Magisty’s jublie. My granddaughers are having my son record everything for them. They are hoping HM uses the glass coach (we call it the Cendarella Coach). They can’t wait to see it. So, it’s really a good deal for you to be a London blogger – you get these great deals! Nice report. Nice pix. Nice of City Cruises. It was fun wasn’t it – most exciting thing my blog has ever got me invited to. And I say that despite the fact that I got wet and had a real chill by the time I got home!